Imagine: You receive an e-mail from the friend of a friend, asking if he might stay with you for a week or so while visiting your town on business. "Of course," you say, but caution him that your home can be a bit hectic: you have two children and two dogs. Your friend's friend says he understands, and is grateful for your hospitality. Now imagine your guest arrives and within days, informs you that his religion precludes him from living with dogs: you will have to remove yours from your home, at least for the duration of his stay. What do you do? If you're like most people, most likely you will suggest that he might more comfortable at a hotel. You may offer to ask other friends of yours if he might stay with them. What you are not likely to do is take the dogs to a kennel, or, should he extend his visit, give them away. On the other hand, you might think, you do not know this man very well. What if he should become violent if you refuse his request? What if he were to hurt the dogs? What would you do then? This is not entirely a hypothetical situation. Rather, it illustrates the conditions Western countries increasingly confront in the face of growing Muslim immigration, and the pressures democracies face in balancing their ideals of equal rights with often-undemocratic demands of Islamic culture. In January, a student taking an online course at Toronto's York University asked to be excused from the on-campus requirement, claiming, according to the New York Times, that "his religious beliefs did not permit casual contact with women." While the professor denied the request, the university did not, on the grounds that "students who lived overseas and took online courses were not required to attend on-campus sessions." Oddly, despite his so-called religious convictions, in the end, the student appeared for class, after all. Canada is hardly alone. Over the past decade or so, several Western governments and communities have agreed to enact changes demanded by their Muslim populations, not in the interest of equality so much as for fear of "insulting" Muslims, or even of the the possibility of violence. In the Netherlands, for instance, the state-run Gemeentemuseum in the Hague in 2007 capitulated to threats by Dutch Muslim groups and removed works by Iranian artist Sooreh Hera from an exhibition: photographs of a gay couple disguised as the Prophet Mohammed and his son-in-law, Ali. The works, said the museum's director, were "insulting" and "inflammatory" – an opinion evidently shared by Dutch Muslims, whose alleged death threats forced Hera, then an art student in Amsterdam, into hiding. More recently, Britain's Channel 4 censored the image of Mohammed from the cartoon "Jesus & Mo." Or take, for instance, the matter of German Muslim girls whose families demand that girls and boys be separated in physical ed classes, and swimming in particular – a demand that was rejected by the German courts last year. Then there are the Muslim families throughout Europe who forbid their daughters to join class trips, or what the mayor of Neukolin, Germany, described to Der Spiegel as "the 18-year-old women who are flown in from Turkey as 'imported brides,' because the patriarch doesn't like the enlightened female Turkish bank employee from Neukolin." The situation seems to have become particularly acute in academia, as the York University case indicates. 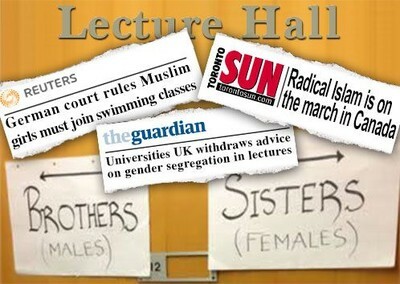 Just a month earlier, the governing body for Britain's universities backed down on a proposal to introduce gender segregation in lectures on Islam. And at Canada's publicly-funded Huron College in Ontario, a non-Muslim was forbidden to audit a course on "Islamic preaching, public speaking, and worship" taught by Muslim convert Ingrid Mattson. Not insignificantly, the Toronto Sun notes that Professor Mattson previously directed the Islamic Society of North America (ISNA) – an organization with ties to terrorism so strong that the Canadian government itself revoked its charitable status last fall. Canada, in fact, seems especially vulnerable of late to the demands and requests of its orthodox Muslim population: in 2004, the country barely dodged a proposal by former Attorney General Marion Boyd to recognize and permit sharia-based tribunals in Ontario despite vocal protests by Canadian Muslim women. And in the latest honor killing to come to light in Canada, a father murdered his estranged wife while disguised in a burqa – raising questions about a burqa ban. Burqas and similar Islamic coverings have, after all, been the disguise of choice for a number of criminals, from bank robbers in California, Delaware, Philadelphia, and France to dozens of robbers and conmen (and women) across Europe; to a woman who donned a niqab in order to kidnap a Muslim child in Pennsylvania. But opponents to such a ban argue that something as personal and intimate as a woman's choice of clothing cannot be legislated in a democratic country. All of these incidents raise critical questions about freedom, democracy, and equality. And with increasing frequency, they fire and feed an urgent debate about how Western democracies can balance their ideals of religious freedom and non-discrimination with the sanctity of equal rights. In a democracy based on divisions between church and state, which comes first – commitment to your nation, or to your faith? And what of the premise of majority rule? In 2006, Dutch Minister of Justice Piet Hein Donner stated that the Netherlands could and should submit to rule by sharia law if the majority so willed it. That, he argued, would be true democracy. That it would also be the end of democracy seems to have been beside the point. The truth is, none of these issues or events involving religious demands on campus or in local communities involve terrorist acts. There are no laws being broken. But they form a clear threat to cultural norms: someone wants the dogs moved out, the furniture rearranged, in the very home that he himself has asked to stay in. Ultimately, it all boils down to this: Is a multicultural society, in fact, really possible, in a truly democratic state? How far does one ideal need to bend to accommodate the other? It's a crucial question. Because in the end, if you bend too far backwards, you can cripple yourself. And we need to keep democracy standing. Dear People, Many have misunderstood Islam, There are some rules in Islam which might look stringent and strict, But that's better for mankind to follow and its for their good(if you believe), Human beings will be free to do whatever they want after their death in Heaven, after Resurrection(If you believe) If you don not believe in Resurrection, then you may live as you like. My thoughts on the solution is that the Muslims should go back to the middle east country they came from to have it their way. ; The primeminister in Australia told his Muslim population that they had the right to come there and they also had the right to leave because they would not except the culture in that country. They are trying to convert all other countries to Islam, that way most of the world would submit to Islam. to see the art that is offensive to Muslims? Don't I have a right to view it? Democracy is not incompatible with religion. But only Islam is. Not all religions are equal, not all cultures are equal. Our democracy was initially founded and based on Christian principles. Don't confuse your hatred for religions with democracy and Islam. Everything Esman said is spot on! We are faced with islamization and we do absolutely nothing to counter this extreme evil which attacks our way of life under the guise of multi-cultures and political correctness. I am from Australia and the concerns raised in this article echo those in my own country. The upshot of it all is that there is no common ground between religion and democracy. Any religion. Religion represents submission, ignorance, bigotry, violence and slavery. Democracy represents freedom; Freedom of choice, freedom of expression, scientific advancement, freedom to agree, freedom to disagree, life choices. Shall I go on? Oh, and I almost forgot. Religion wants your money. All of it. Every cent!